Mid Valley Megamall (03-2282 2413). THE BBQ joints in Korean dramas seem like fun places with friends gathered around the sizzling pan cracking jokes, or girl feeding boyfriend a piece of meat nicely wrapped in lettuce leaf. The BBQ houses in Kuala Lumpur offer a taste of the K-drama fun just like as seen on TV. Even though there are a number of such establishments here, Bulgogi Brothers is convenient as it has outlets in shopping centres and is pork-free. Headed by a chef who once served at the Blue House (South Korean equivalent of the White House), Bulgogi Brothers was first set up in the Gangnam district in 2006 and has expanded to 46 outlets in South Korea, and can also be found in Canada, China, Vietnam and the Philippines. Chaswood Group has brought it into Malaysia, Singapore, Thailand and Indonesia. The restaurant that serves contemporary Korean cuisine was awarded by the National Brands Award in Korea as the Best Korean Restaurant 2012. “The standards at Bulgogi Brothers are set very high and consistency is of utmost importance. A team was sent for three month’s intensive training to South Korea, and more than 70% of the ingredients used to make the dishes, including sauces and broths, are either imported from Korea or made fresh daily by trained chefs,” said Chaswood Resources Sdn Bhd senior marketing manager Ivy Ho. 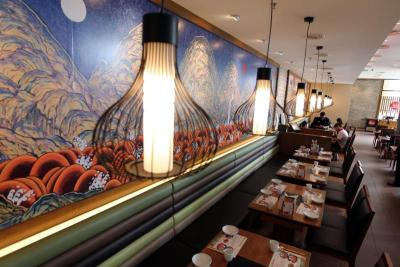 Convenient: Bulgogi Brothers offers a contemporary decor and outlets are often located at shopping centres. “Even the sweetness, salinity and acidity of the dishes are checked with devices instead of the cooks” taste buds to ensure precise consistency. “Bul means fire and gogi is meat, but the BBQ dishes still offer a variety of flavours depending on how they are prepared,” she said. One popular dish is the Seoul-style Bulgogi that is served with broth in a steel pan, and heated up using the built-in induction cooker. The beef is thinly shredded, marinated in special bulgogi sauce and tendorised the natural way using kiwi. The broth is flavoured with pear and apple, and lures with fruity sweetness that goes well with the meat, glass noodles, enoki mushroom, leek and onion. This bulgogi offers everything at one go and is ready to be savoured in a short time, hence the right choice for busy urbanites in Seoul. 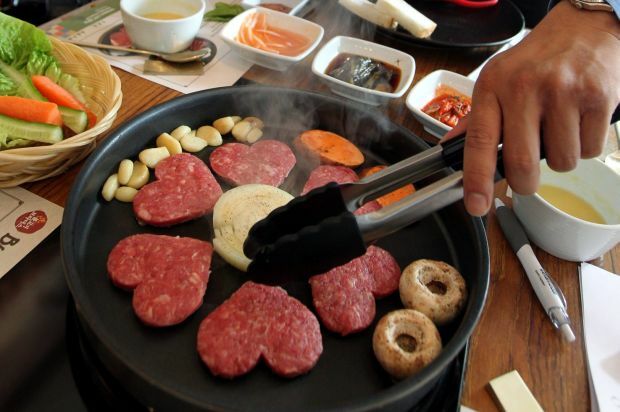 For a lovey-dovey experience, choose Unyangsik Bulgogi as the well-seasoned minced meat is presented in heart shapes. It is learned that Unyang is a romantic place frequented by lovers, and cutting the beef into heart shapes urges one to handle them with care. ?It is a royal dish and at our restaurant, this dish is made upon order as the shelf life of the meat is only three hours,? Ho said. The meat is juicy even though it is barbecued, and the grilling is done by the staff to avoid overcooking the fine Australian grain-fed beef. For added flavour, try including garlic and even kimchi into the lettuce that wraps the meat. Guests at Bulgogi Brothers will receive a complimentary welcome food (sweet potato, sweet bean, corn), soup of the day, six refillable side dishes (pickled raddish, pickled water spinach, kim chi, sweetened lotus root, pumpkin salad and spinach) as well as tea (corn, brown rice or buckwheat tea served on rotation basis). Korean perennial favourites such as Bibimbab (rice mixed in a bowl) and Jjigae (stew) are not left out, of course, and given an interesting twist. The Bibimbab is enhanced with seafood that goes well with the vegetables and special sauce, while the stew is prepared with tuna ? a rather uncommon ingredient in Korean cuisine and served with tofu and rice cake in spicy kimchi paste. The latter is appetisingly tangy. Spicy Chicken Maekjeok (skewer) appeals with special sweet and spicy sauce, and is said to be a dish specially designed for Malaysian diners.